We will use a null-space, active set approach. We will follow the notations of section 9.1.1. 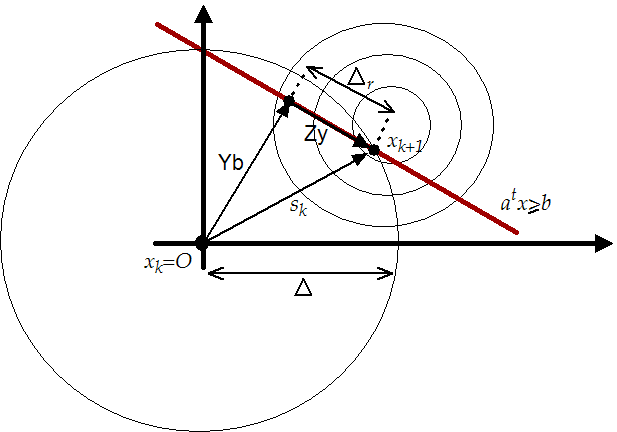 Let be a vector of Lagrange Multiplier associated with all the linear constraints. This vector is recovered from the previous calculation of the constrained step. Set , The constraints which are active are determined by a non-null , . If a associated with a non-linear constraint is not null, set NLActive , otherwise set NLActive . Compute the matrix and associated with the reduced space of the active box and linear constraints. The active set is determined by . True: We will use the SQP algorithm described in the previous section to compute the step . Once the step is calculated, check the Lagrange Multipliers associated with the non-linear constraints. If they are all null or negative, set NLActive . Where the trust region radius used in the reduced spaced is as illustrated in figure 9.6. Compute the Lagrange multipliers . If for all constraints then terminate. Remove from the constraints which have negative . Check if a non-linear constraint has been violated. If the test is true, set NLActive , set and go to (2). Solve 9.13 and add if necessary a new box or linear constraint inside . Set and go to (2). This is really a small, simple sketch of the implemented algorithm. The real algorithm has some primitive techniques to avoid cycling. As you can see, the algorithm is also able to "warm start", using the previous computed at the previous step.